Velma started my tour of St. Louis in South Grand, which happens to be the gay neighborhood (no wisecracks), where we walked around and I marveled at all the brick buildings. So much brick everywhere! I was in heaven. I love old brick buildings, and so far this place was putting even Boston to shame. We had Thai at a pretty good place for lunch; the food was too hot for the redhead, however. I browsed the Riverfront Times, which is the equivalent of the SF Weekly. 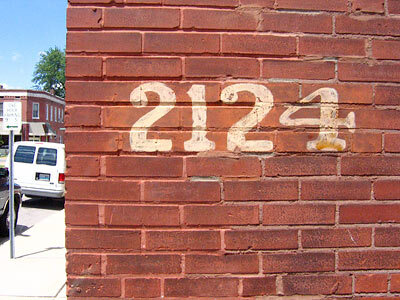 We headed over to Cherokee Street, which is an old neighborhood (they're all old!) 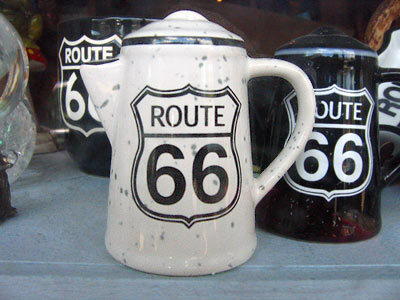 with a lot of antique shops, and we took pictures of cool old stuff, and kittens. There were puppies and kittens. Yes. Puppies and kittens. As we walked along, protruding high above all the buildings in the not-too-far-off distance was this high brick tower with "LEMP" pained on it in letters that must've been at least a story tall. We kept musing about what it might be, especially because we kept passing streets and buildings and businesses with the word (?) 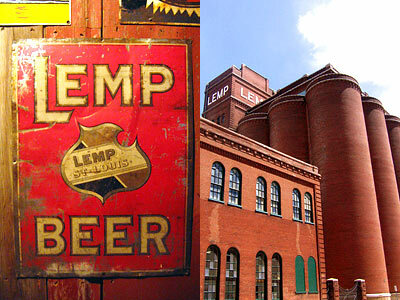 lemp in their names. Turns out it was the site of the Lemp Brewery (long closed, sadly). Pretty cool lookin' old factory, though. 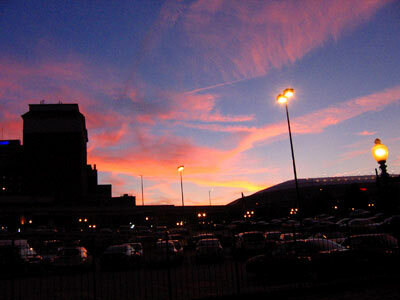 The Busch brewery (still open, sadly) happens to be about three blocks away, which we discovered when we kept walking. We needed some fuel (read: caffeine and sugar) by this time, so we found a new and quite deserted caf� in Layfayette Square, an area Velma wanted to show me. You can't do St. Louis without going up in the Arch. Well, you can actually. And I was quite prepared to, since I'm not usually one who has a burning desire to stand in long lines amongst the great throngs of those rather strange life forms known as tourists. But my dad had told me he'd seen some snazzy documentaries on TV about the building and engineering of the big upside-down U, plus Velma had told me that it was actually pretty cool to go up in, so we decided what the heck. It really was pretty cool. Once I got past the security, that is. Since it's part of a federal park, and, I suppose, a tasty target for terrorists, there are now queues and metal detectors. As luck would have it, we ran into the guard with the inferiority complex at being the equivalent of a park ranger when he most assuredly would've preferred to have passed the police academy entrance exam on the third attempt. So, after the slight delay and mild frustration imposed by the small man with the big arms, we paid our $20 and killed a little time in the underground museum before our tour's time, and then crowded into the little white pods to head 630 into the air in the huge metal Arch, or, as I like to refer to it, the half-a-McDonalds-logo. The view is pretty cool (those little white specks in the photo above are people). 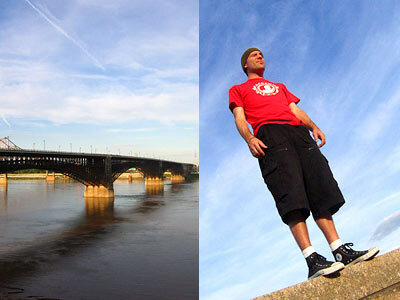 On one side you're looking out over all of St. Louis, and on the other side's the river and Illinois on the other side. We actually spent something like 45 minutes up there. 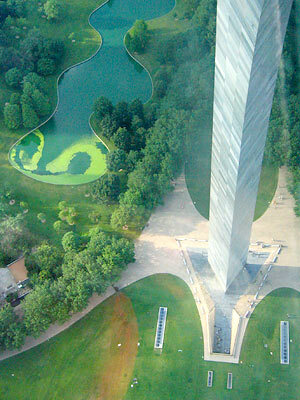 At one point a group of people laid down on the grass way down below, spelling out "Hi" to the people up in the Arch. Afterward we walked over to the Landing, which is a small district across the street from the park where the Arch is located, and had dinner and rested our feet. 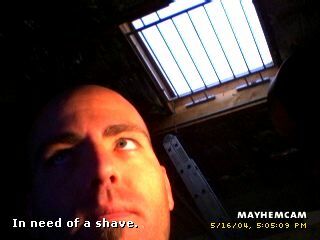 It'd been a long day so far, and I wasn't even sure if I was going to be up for the City Museum, which I'd been looking forward to. Ooooo you look like a beanpole with a hat. 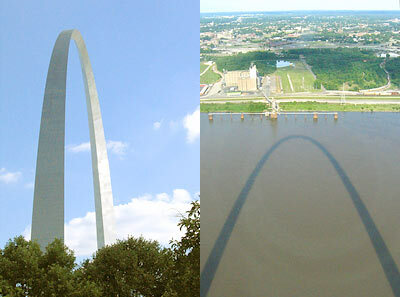 Damn, I never knew the arch was that huge. Very nice photos! 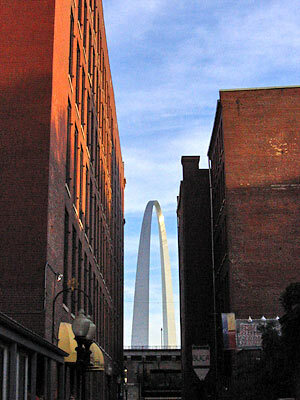 I especially like the shot of the arch through the buildings, and the two-up with the reflection. Yea bro, love the photos. Wicked shots for sure. I live just a few blocks south of the brewery, looove that yeast smell in the air!! Woah. Love the pictures!! 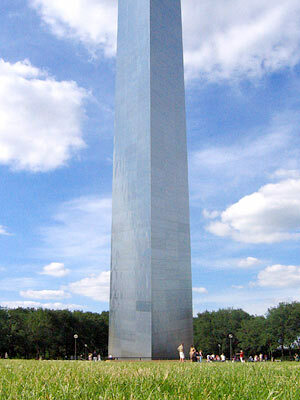 I love St.Louis too. Keep up the good work! And they say everything in Texas is big!